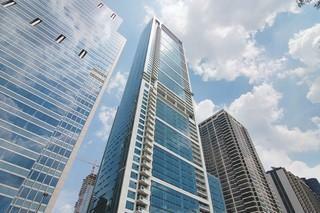 Rare and coveted 1 of only 2 floor plans like it in one of the premier buildings in Chicago. It is the largest 1 bedroom, south facing, corner unit floor plan at 340 On The Park. This South and East corner home features a 30' expansive living and dining area, full height floor to ceiling windows. The kitchen boasts quartz counters, mosaic tile backsplash, GE Monogram stainless steel appliances, culinary vented hood, Snaidero Cabinetry, under mount sink, and bamboo floors. The bathroom is dressed in natural stone with Snaidero Vanities (2). The well situated, elegant bedroom is approached through an entry foyer with laundry partition with large volume LG washer/dryer and a walk in closet with built in custom cabinetry (California Closets) which includes a LED lighted desk, large hanging space and drawers. The entire apartment has contemporary gray roller shades and the bedroom has both shades and light blocking, fire-retardant designer draperies. Garage heated parking at $65,000. Property information last modified by seller on Tuesday, May 01, 2018, 09:10 AM CDT. Information Deemed Reliable But Not Guaranteed. Unauthorized duplication, use, or linkage is prohibited. The information on this web site is for personal, non-commercial use and may not be used for any purpose other than to identify prospective properties consumers may be interested in purchasing. Monthly Payment Calculator results are for illustrative purposes only, not a financing opportunity; calculations assume a 30-year fixed-rate mortgage and do not include closing and other costs. Property Tax on NEW properties is estimated at 1.5% of Listing Price for payment calculation purposes; actual value may be higher or lower.